Seychelles (Listeni/seɪˈʃɛlz/ say-shelz; French: [sɛʃɛl]), officially the Republic of Seychelles (French: République des Seychelles; Creole: Repiblik Sesel), is a 115-island country spanning an archipelago in the Indian Ocean, some 1,500 kilometres (932 mi) east of mainland Africa, northeast of the island of Madagascar. 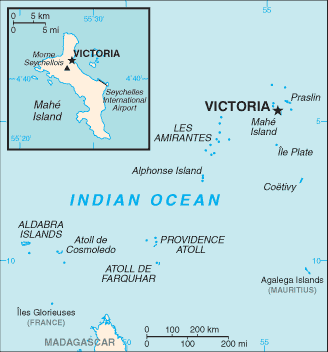 Other nearby island countries and territories include Zanzibar to the west, Mauritius, Rodrigues, Agaléga and Réunion to the south, and Comoros and Mayotte to the southwest. Seychelles, with an estimated population of 86,525, has the smallest population of any African state. It has the highest Human Development Index in Africa and the highest income inequality in the world, as measured by the Gini index. Seychelles is a member of the African Union.